The character of Ching Lung Soo comes to us courtesy of The Vanishing Conjurer by Mike Lewis and Simon Price, a Call of Cthulhu adventure published by Games Workshop in 1986. And the miniature which I've painted is from Citadel's CC1 Gothic Horror range -- a set of miniatures produced under license from 1985-1987 for use with Chaosium's Call of Cthulhu role-playing game. Although the miniature is clearly patterned off of Lee Gibbons' cover illustration, in the miniature catalogs published by Citadel, he is denominated as "Fu Manchu". 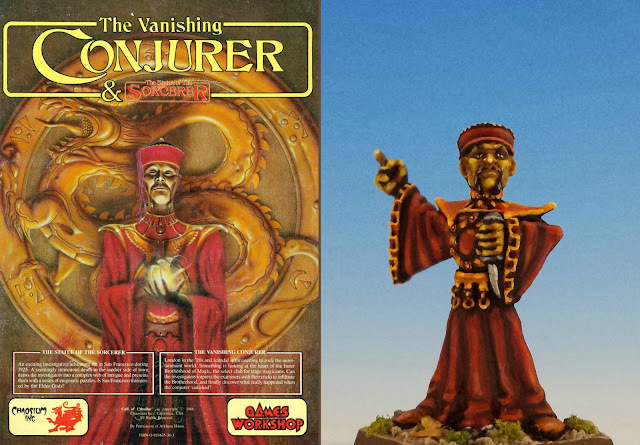 The Vanishing Conjurer is a fantastic adventure. Because it requires the characters to infiltrate the theatres of London and figure out the mechanics of several stage illusions, it's filled with historical lore about the magic business. Many diagrams are taken directly from Tricks and Illusions, a magic manual written by Will Goldston and published in 1909. I love the interplay between illustrations and miniature sculpting. The Gothic Horror range is filled with such overlap -- such as Rabbi Joshua Cohen, who I discussed in my post about Citadel's portrayal of Jewish characters. Another example is Chris Marrinan's cover for The Fungi from Yuggoth (1984). 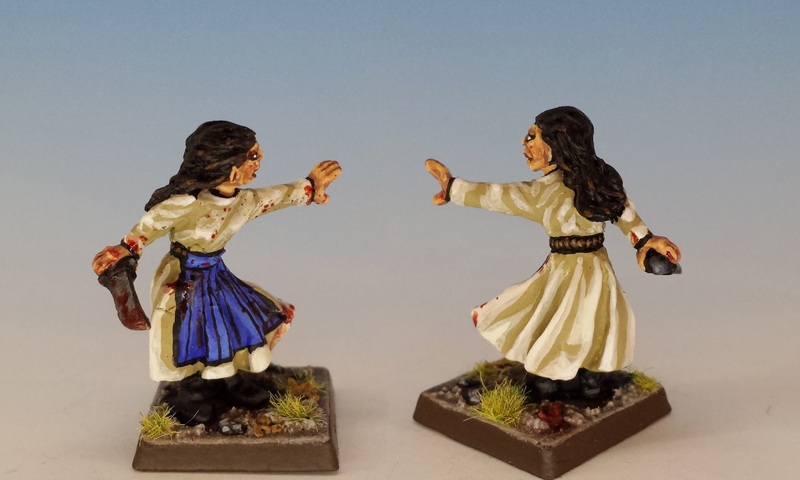 The Gothic Horror miniatures "The Heroine" and "The Explorer" replicate these figures exactly, right down to the eye-glasses and the surprised expressions. In my own way, I'm trying to continue that tradition of weaving illustrations together with Cthulhu miniatures. 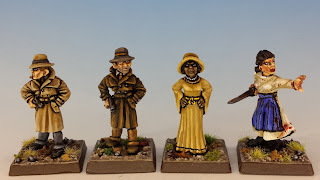 I'm doing this as part of my project to match old Gothic Horror miniatures with modern characters from Fantasy Flight Games' Eldritch Horror game. Who said you can't pour new wine in old wineskins? Whoever he was, I bet he didn't game. The first character from Strange Remnants is Tony Morgan, the Bounty Hunter. The miniature is "Bogart" from the LE3 Gumshoes set that was sculpted by Bob Naismith (The "LE" stands for "Limited Edition"). Second is Marie Lambeau, a creole chanteuse. Her miniature is "The Lady" (1986) from the CC1 Gothic Horror range. 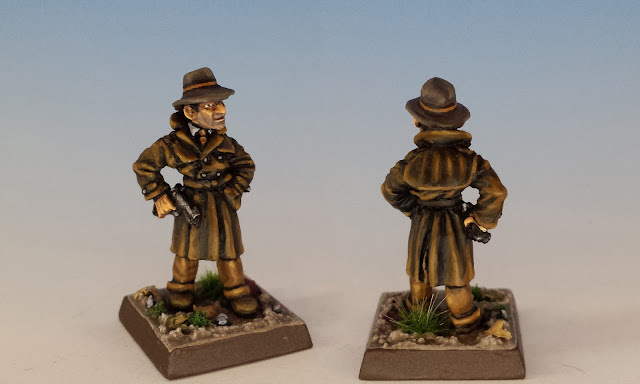 There are a couple variations of this miniature, some with and some without that hat. The third character is the infelicitously named Skids O'Toole, an ex-convict. That's a name that would embarrass the authors of a Bazooka Joe comic. Oh well. The miniature is the CC1 Gothic Horror "Detective". If he looks a lot like Bogart, that's because this is another example of the many variant miniatures that fill this range. Finally, there's Zoe Samaras, a Cthulhu-investigating chef (?!). Well, not just any chef -- a crazed, knife-wielding chef of Greek extraction. Sadly, the Gothic Horror range lacks any portrayals of crazed, knife-wielding chefs of Greek extraction. Shocking, I know. Well, I supplied the gap by modifying an old Citadel female wizard and then splattering her liberally with blood. Remember, Vote Cthulhu for President! Something really amazing, I love this atmosphere. Painting as always at a high level! There are at least 30 investigators for EH so far- this is going to be a great side-collection! Once again your collection astounds! The paint jobs are ace as always, I admire the care you put into your posts, there is always a catalogue reference, sculptor, release date and other tidbits only a passionate collector would bother to include. The inclusion of these figs will only add to the enjoyment of ARKHAM Horror. You are a tribute to the movement Sir. I feel like it's important to put in those details, but it sometimes takes me forever to track them down... so it's good to hear that you appreciate them. Thanks, 24_C! Excellent! I love Samaras the best, perhaps because where I live there is a prominent family of seafood merchants of the same name! Stay away from the calamari! Splendid colors and great details...so many souvenirs for me! Excellent job! 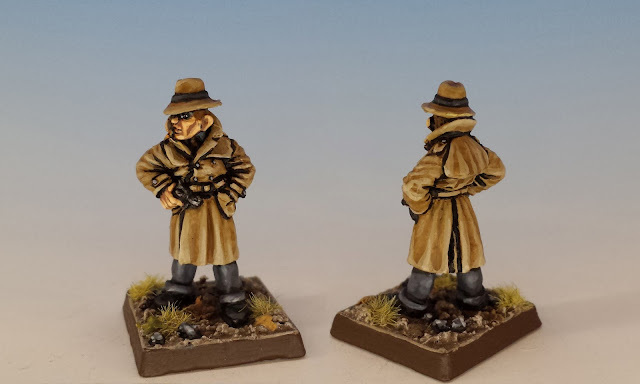 This is a fantastic little post about a rarely discussed facet of GW's classic past. More please!!!! That get's at the larger question of inspiration. Clearly, some miniatures were based off of pictures, like in this post. (And clearly the reverse happened too... I think Warhammer Armies is filled with illustrations based off of pre-existent miniatures.) 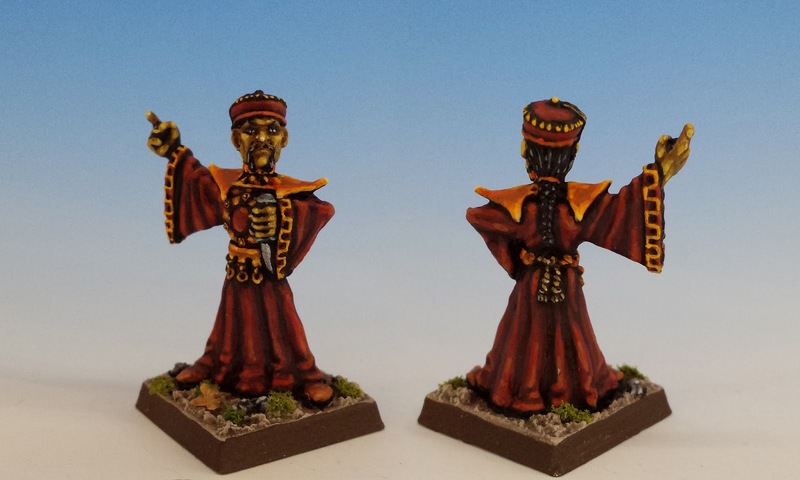 But there were other inspirations too... like basing miniatures off of employees at GW, like the Steve Jackson pirate, or Antonio/Tony Epstein from Lichemaster. I'm sure there are dozens of others... since you, Orlygg, have such excellent access to the old-timers at GW, it would be interesting to see what you can dig up about that! The Elder Party candidate is looking better all the time. Given the current "contest" between a statist oligarch and her pet baboon, how could he not? Sorry. Bit of a raw nerve there. On a happier note, the minis look terrific. Really dig the crazed, knife-wielding chef of Greek extraction. It's best not to mispronounce "gyro" when she's around, I guess. Ching Lung Soo reminds me very much of one of the major baddies in the old Doctor Who serial "The Talons of Weng-Chiang". Unfortunately that character was considered by some viewers to be a racist caricature, although I found him to be a surprisingly complex and even sympathetic villain. It's funny that there's a similarity here, given the Fourth Doctor's writers' fondness for "eldritch" storylines. I's so glad you brought up that Dr. Who series! I think you are bang on that there's more than a whiff of Weng-Chiang to the "Disappearing Conjurer". That serial scared the crap out of me when I was a kid. Well, thanks to your comment, I feel compelled to pay my $6 to iTunes so I can rewatch it!